I just got back from a wonderful trip with my sweet hubby to Hawaii!! We are celebrating our #10 this year and wanted to do something really fun! Thanks for the emails to check up on me:) That was very sweet!! We had such a blast!! It was unreal. I am so happy to be home though. It was nice to have a break from the kids, but I couldn't wait to be around them again!! After spending time away from them I just can't help but feel so happy to have my little darlings around me again!! For a week we were able to do whatever we wanted and not really think about anyone else. Don't get me wrong, it was incredibly fantastic, but I missed having 5 little people to serve. I'm really happy I get to be a mommy!! I hope you all had a wonderful Easter as well!! I thought I'd share with you what has been on my mind lately....I've been thinking a lot about space management. Not the starry sky kind of space, but the space in my home. I want to put it to good use. I have some areas that are oddly built and seem like just a waste of space. Do you have any of those in your house? Sometimes I daydream about taking the square footage of my house and redistributing it so it makes a little more sense. It's kind of a fun day dream. For instance, I would love to take 20 square feet out of my bedroom and stick it into my laundry room. Wouldn't that be cool?? Completely impossible, but cool. Since that isn't a realistic option I have been dreaming about built-ins. 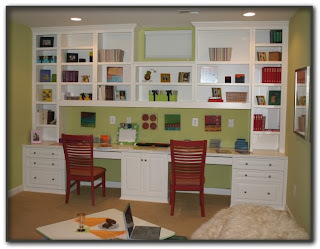 Sticking cabinets and shelves into every spot of unused space. Now that would be fun wouldn't it??? 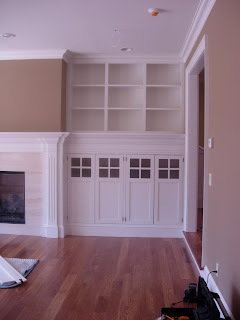 Here are some built-in pics that I really enjoy. Not that any of them are a realistic option for this girls budget, but inspiring to look at anyhoo! This one is by Rschellings. This lovely bench is by Custommade. 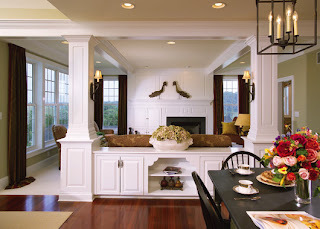 This is Nyack Custom Woodwork. This is Jeff Smith Homes. I also love the paint choices of these rooms. I really like the brown and white . The green is great too. 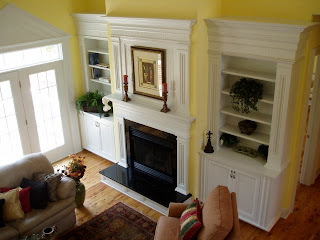 I think that it's easier to go with bold colors in a room when you have a huge white built-in taking up a majority of the wall. You can pretty much get away with any color. Although you will probably never see something like any of these in my home, the idea of making my rooms really efficient is exciting for me. 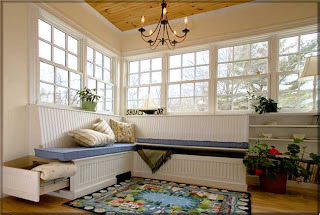 I totally admire people who can take a very small area and utilize it well. It is a talent that I would someday like to have! Glad you had a fun trip...and glad you're back too! Thanks for bringing warm weather back with you! I'm with you on the built-in's. I love them, and I'd love to have them in my house too. I have dreams of being efficient and organized. One of these days I'll put Kenny to work!